Joanne Monaghan’s 35 year political career came to halt (at least for now) Saturday when she came third in Saturday’s municipal mayoralty election, behind Phil Germuth and Trish Parsons. The best analogy is that of the sports star or coach who stays one season too many. Monaghan had set her sights on 40 years in local politics. But in the 2014 mayor’s race she ran up against a strong sentiment that it was time for a change. She probably allowed that career goal to override any political instincts she may have built up over those years where a small town politician has to keep track of the pulse of events. 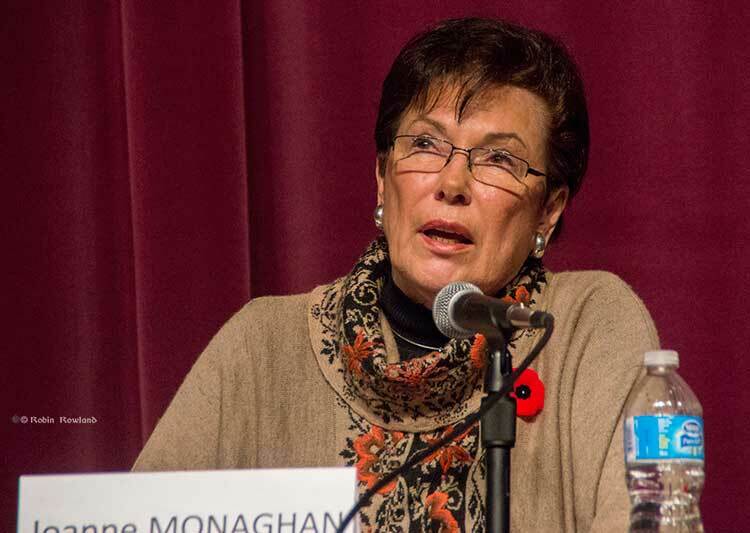 Monaghan has an impressive track record: municipal councillor since 1980, mayor since 2009. That means Monaghan was mayor during some of the toughest times that Kitimat has faced after the Eurocan pull out. She served two terms as the head of the Union of BC Municipalities (the first woman) the third woman to be president of the Federation of Canadian Municipalities. She was Chair of the Regional District Kitimat Stikine for eight years and Vice Chair for nine. She has served on the British Columbia Heritage Trust, the Northwest Community College Board, the Provincial Tourism Council, and the Provincial Transportation Committee. Monaghan is also a member of the Northern Development Initiative, and is chair of the University of Northern B.C. Advisory Committee. The Canadian International Development Agency sent her to Ecuador on a “Municipal Government Technology Transfer between a community in Ecuador and Kitimat. She also facilitated workshops in “Women in Politics” in South Africa and Ghana. Monaghan served on many local committees, both community bodies mandated by council as well as volunteer groups. Her 35 years in local politics mean that she knows everyone in town. 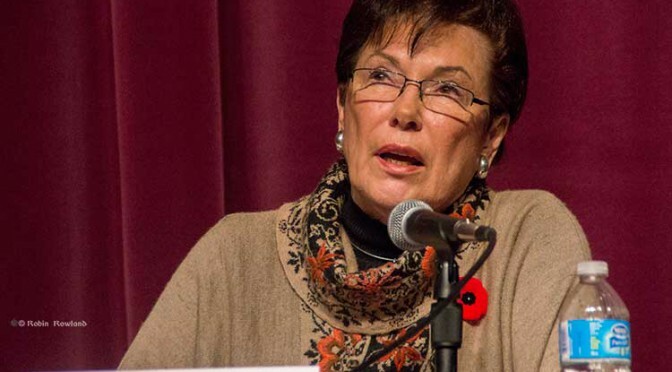 Her 35 years in municipal politics allowed her to build up valuable contacts in other municipalities, provincial and federal politics as well as the media. Joanne Monaghan was a model mayor for a small town, for 35 years she was always available to members of the Kitimat community, always ready to respond to a phone call or an e-mail from a Kitimat resident, working hard on issues from restoring old sidewalks to bringing new industry to the valley. She was always available to show up at a local event, even if it was just for a few minutes. So want went wrong with her campaign? Monaghan was successful in bringing Tim Horton’s to Kitimat, an asset to any community. She worked hard to bring other business small and large to Kitimat. If nothing much ever happened in Kitimat, if it was a small one industry town expanding into tourism, Monaghan would probably have been re-elected on Saturday. If Kitimat was a town facing one major issue, Monaghan might still be mayor. What made Joanne Monaghan a great small town mayor was also her weakness, trying to do too much and thus while trying to handle a growing number of cascading important issues, becoming overwhelmed by them. Kitimat is facing Northern Gateway, three liquified natural gas projects, Rio Tinto Alcan Kitimat Modernization, the airshed problems from all those projects, the housing crisis, bettering relations with the Haisla, just to name a few, as well as sorting out normal municipal priorities like maintaining sidewalks. As early as a year ago, a feeling began to grow in Kitimat that Monaghan wasn’t skeptical enough about some of the companies coming to town bearing gifts. Monaghan tended to avoid the tough questions on Northern Gateway, punting issues (to continue the sports analogy) until the Joint Review Panel reported. Monaghan was not alone among council in burying its head in the sand over the Joint Review Panel but as the leader of a group that is supposed to operate with collegial consensus, Monaghan blocked any real involvement by the District in the JRP. While Monaghan had helped bring Kitimat from gloom after Eurocan to current fragile boom with the KMP and LNG, there was a feeling that hungry for good news, she was too often willing to accept the assurances from the big corporations dealing with council. At council, other members began to outshine Monaghan. On different sides of most issues, Phil Germuth and Mario Feldhoff, despite both working full time, always came prepared, files full of documents, facts and figures. Rob Goffinet was always ready to ask a skeptical question. Rookie Edwin Empinado wore his idealism on his sleeve, although he sometimes struggled expressing his focus on issues. Monaghan, on the other hand, often seemed unprepared and inflexible on major issues. Throughout the summer, there was speculation and conversations around Kitimat, about whether Joanne Monaghan would stand for another term as mayor. In a metropolitan city, polling would have confirmed that there was a growing feeling that it was time for a change. If Monaghan noted the warning signs, and they were noticeable in a small town, she chose to ignore them. When Monaghan said in her campaign literature that she would “stand up to outside influences and special interest groups” who did she mean by “special interest groups?” If she meant Douglas Channel Watch the most prominent “special interest group” in town or the no vote in the plebiscite in general, she narrowed her options, since Trish Parsons was the “pro-development” candidate. If there was a moment where Monaghan really lost the election, it was her performance in the all candidates debate at Mt. Elizabeth Theatre. Phil Germuth shone in the debate and Trish Parsons was a close second. They were clearly prepared and rehearsed, ready with their statements and with their answers to the questions, winging the questions that were totally out of left field. The generational difference between Monaghan and her rivals was clear on stage. It appeared she hadn’t properly prepared, her answers rambled and she was frequently cut off by the moderator for going over the time limit. A solid debate performance might have brought some of Monaghan’s former supporters back into her camp but that never happened. 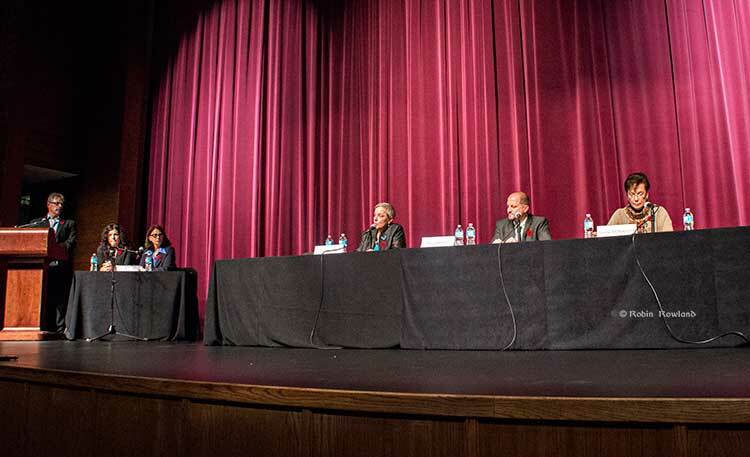 Although Parsons performed well in debate, the feeling in the community was that, despite her work with the Chamber of Commerce and community groups, she should have “paid her dues” by at least one term on council before trying for the mayor’s chair. So Parsons was unable to build support beyond her pro-development base. With Monaghan’s support slipping away and Parsons stalled, the community vote went strongly to Phil to Germuth. So what is Joanne Monaghan’s legacy? That legacy is that she is the model small town mayor who answered everyone’s phone calls and e-mails, who listened to everyone’s points of view, even those she clearly disagreed with, while also being the model small town mayor who worked hard to tackle district wide issues. As far as the national media is concerned, Toronto’s notorious Rob Ford created his Ford Nation supporters through a personal touch, by always returning phone calls, making sure Toronto responded to even the most minor complaints. But even before Ford’s personal problems became worldwide media fodder, it was clear that Ford was too often neglecting handling the big picture, the Toronto wide issues, for a constituent’s crack in a sidewalk. Monaghan was working on that personal touch when Ford was still in high school. Monaghan was smarter than Ford (if Monaghan was a A, Ford was an F), for 35 years she balanced the personal touch with active concern and dogged work for the entire District. Between 2011 and 2014, Kitimat jumped from the minor leagues to the Premier League, and there was a clear demand for fresh blood to strengthen the political team. The voters decided that the veteran team coach should retire. But Coach Monaghan still does have a shelf full of trophies from those 35 years. If this really was the sporting world, her number should be retired as well and lifted to the rafters.